Here she is: my granddaughter, Charlotte Maudie Hazelwood, born on 19 April, weighing 8.4 pounds. Obviously, that's Mum and Dad (Zoe and Brandon) sharing the spotlight. Charlotte is ten days old today, and a perfect picture of happy, contented babyhood. Oh, Mum's doing well, too. In fact, she and Dad have taken to parenthood like ducks to water. They share all the tasks (even the messiest ones), acting as if they've been doing the job for years. I'm so proud of them all. 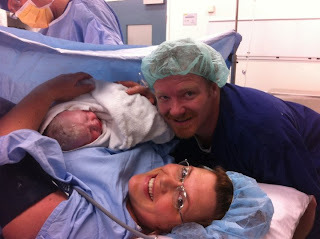 And privileged to be allowed to share in the great joy of welcoming a new baby into their lives. So very very happy for the new Mum and Dad, and in fact, for you all. I've said it before...and I'll say it again: that is one utterly gorgeous baby. Zoe looks positively radiant, too. Congrats to all of you! Wonderful news. Being a grandparent is the best. Love 'em, spoil 'em then hand them back!